As business demands change, corporations face a widening gap between the skills they need and the expertise available in the existing workforce. Today’s corporate leaders must therefore plan their learning and development strategies several years in advance, and build a roadmap to upskill and reskill current employees so that they are well-prepared for future business requirements. 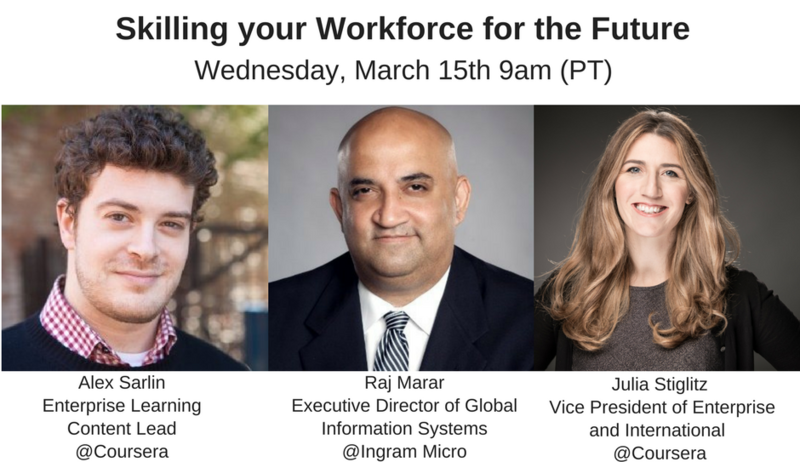 In this webinar, Raj Marar, Executive Director of Global Information Systems at Ingram Micro will be in conversation with Julia Stiglitz, VP of Enterprise and Alex Sarlin, Enterprise Learning Design Lead at Coursera to discuss the use of cutting edge strategy to solve for today’s L&D mission, shifts in work and learning, and the challenges and opportunities for L&D leaders in this new landscape. Register here to learn about the latest workforce development trends! If you are interested in Coursera for Business service, please fill out this form.